REMOVES (not masks) odors of pets, urine, cigarette smoke, marijuana smoke, dead rodents, pet litter box odors. GREAT for realtors during open houses; apartment building managers, RV'ers and boaters, anyone living in humid climate, pet owners, etc. Keep one in your car to keep it smelling fresher. GREAT for dorm rooms, locker rooms and lockers, fitness and change rooms, and anywhere odor-causing bacteria is present. CLEARS the AIR of musty and moldy smells - GREAT for use in basements and storage rooms. ELIMINATES garbage and trash odors - use in dumpster rooms and closets; storage rooms, vacant properties etc. ALL NATURAL, non-toxic, safe for pets and children, easily and naturally disposable. 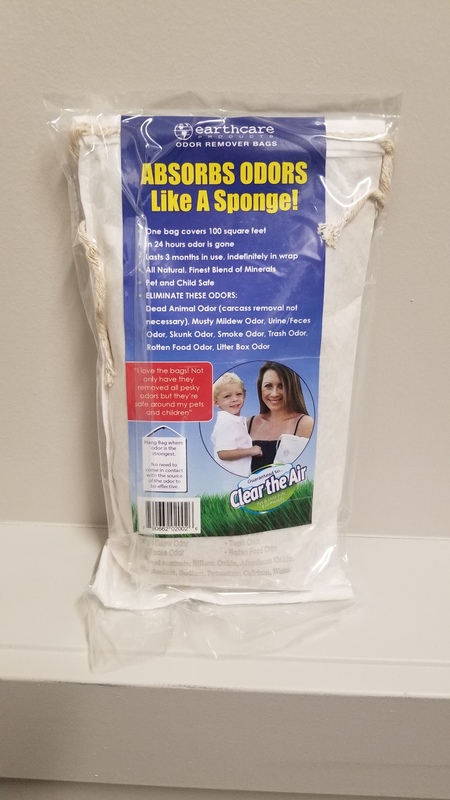 MADE IN THE U.S.A.
No need for the contents to come in contact with the source of smell - just place the bag in the room close to the source and most odors will be gone or greatly reduced in 24 hours. One bag covers 50-100 square feet and lasts 3-4 months. For the past few years your company has been able to totally eliminate our rat infestation, which has allowed us to make changes in our behaviour in order to prevent the conditions that allowed the rats to flourish.